Klaus Geus is an ancient historian and geographer. 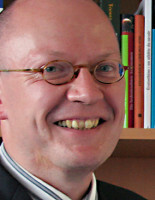 In 2009 he was – courtesy of Topoi – appointed professor of the historical geography of the ancient world at the Freie Universität Berlin. Geus works in the areas of ancient sciences (especially geography, astronomy, metrology), ancient historiography (especially Herodotus and Polyaenus), and ancient Africa (especially the Carthaginians and the Horn of Africa).